Piazza Dante is a bit of welcome wide-open space in a city notoriously lacking in elbow room. It was closed for a few years while they built the new Metropolitana underground train station. Now that that is finished, it was well worth the wait for two reasons: one, it's a place to sit down or stroll around a bit in the middle of a busy city, and, two, the square is now conveniently connected to the Vomero section of town a few miles away and 600 feet higher in elevation. This square, named for one of the greatest names in world literature, is dominated by a 19th-century statue of the poet, sculpted by Tito Angelini. 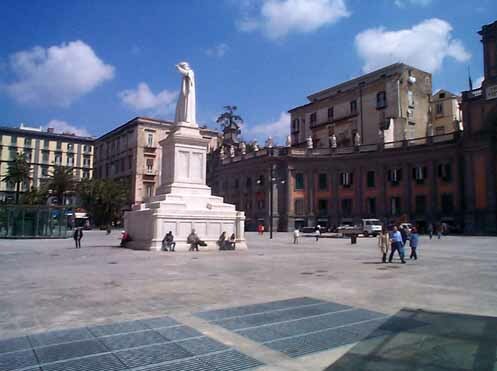 Long ago the square was called Largo del Mercatello—simply, Market Square—and, then, in 1765 was rechristened "Foro Carolina," after the wife of the King of Naples. At that time, the original square was greatly modified by Luigi Vanvitelli. He essentially converted the rear of a huge and ancient (from the 600s) monastic complex, St. Sebastian, into the front of his new building that was to look out over Foro Carolina. The monastery remained open and Vanvitelli opened a new entrance from the "new" square. (The old monastery premises once served as a music conservatory and now serve as a high school.) The ornate semicircular arrangement of columns and statues that now fronts on the square was originally intended to depict the virtues of Charles III, the first Bourbon king of Naples; the niche in the center was to have been dedicated to the monarch. It now, however, marks the entrance to a boarding-school named for Victor Emanuel II. Piazza Dante was the site of the Cafe Diodato, a gathering place of actors at the end of the 19th century, who, during the summer months would perform on a stage set up amid the tables. Facing the great semicircular building, one sees Port'Alba on the left. Port'Alba was an old city gate, moved in the 17th century by the Spanish viceroy Duke d'Alba Antonio Alvarez de Toledo, and incorporated into the restructured Foro Carolina. On the right is the Church of San Michele, and across from the square is the Church of San Domenico Soriano with its adjacent convent, now housing the municipal registry office. Poor Dante was moved 100 meters away in order to accommodate the construction of the new metro train station, finally opened in March of 2002. He was put back center-stage and sand-blasted clean as a whistle. That has to be repeated periodically due to morons with magic markers and cans of spray paint.